When Russian-Armenian boxer David Avanesyan arrived in England in search of training, he didn’t speak a word of English. On Saturday, February 18, he makes the first defense of his world title. He spoke to RT Sport. English manager Neil Marsh could never have predicted what his fighter David Avanesyan would achieve in such a short space of time. “Words can't explain how happy I am for all involved. I'm very proud for David. This is my biggest achievement and first world champion I have managed,” Marsh said. Merely months ago, the two were introduced by a promoter and struck up a close relationship. In that time, Avanesyan has won the interim WBA world welterweight title, defended it against a ring legend in the United States, and been elevated to world champion. He currently has a professional record of 22 wins and only one defeat, with half of those wins coming by way of knockout, and conducts training under Carl Greaves in Nottingham, England, and trains and spars with some of the best fighters in Britain. His surroundings are wildly different from those of his hometown in Pyatigorsk, close to his family’s homeland of Armenia, to which he has extremely close ties. “How proud he is of both countries – Russia and Armenia – and family. His culture seems more close than that of many I see in the UK,” Marsh says. Soon after arriving in England, Avanesyan captured the interim WBA world welterweight title in Monaco in 2014, with a vicious display of body punching to record a 9th-round KO. He then faced American all-time great ‘Sugar’ Shane Mosley, defeating the former three-weight world champ on points. 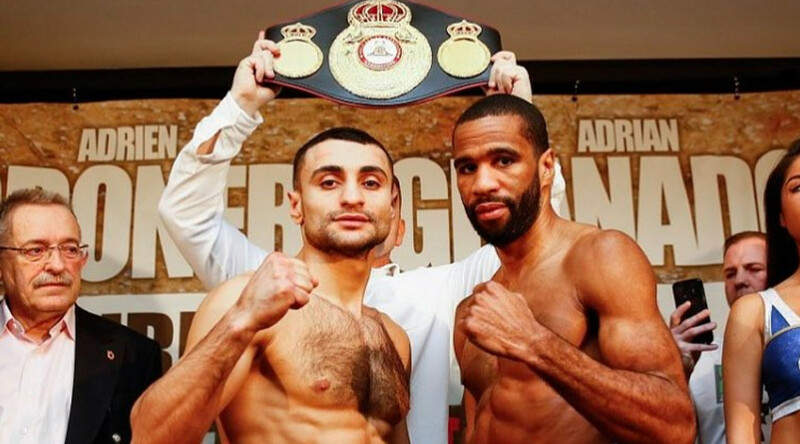 “My second fight with the team, was already for a title of interim champion,” says Tabynskoe-born Avanesyan. “Then after a defense against one of the legends of boxing [Mosley] in an American ring. The fight against Mosley catapulted Avanesyan onto the world stage, and soon after he was elevated to full world champion. On Saturday, February 18, he will make the first defense of his world title against US star and former world champ Lamont Peterson in Cincinnati, Ohio. Taking time before he flew to America for the fight, Avanesyan spoke to RT Sport. RT: How proud are you to defend your world title in the United States against Lamont Peterson. It is something very few Russian fighters have done in the past? David Avanesyan: I think that it’s right, I think that it’s great. I am proud of the fact that I am fighting to defend the world title in a different country and therefore I have even more responsibility. I understand that everybody at home is supporting me, a lot of my fans can actually come to the fight, so that will be great. Everything will be in his favor – it’s in his own backyard, although there will be some of my fans there too, a lot of my close friends and relatives with come to support me. But I know the main part of the fans will be against me, but I will showcase my skills. RT: How do you rate your physical shape for this fight? DA: I can say that I am 100% ready for this fight, as it’s been a really tough training camp. My team and I have been through a huge amount of productive work. I’m ready to and am looking forward to this fight. RT: What threat does Lamont Peterson pose to you? DA: Lamont Peterson is a very tough, worthy opponent, a really decent fighter and a former world champion himself (Peterson held the IBF & WBA world titles at light-welterweight). The main threat he poses for me is that he is the challenger to my belt. RT: You have a very active style in the ring, but Peterson said you are easy to hit. What do you want to say to that? DA: To be honest, I haven’t even heard anything about him saying that particular quote. But I can say myself that everything will become clear in the ring. RT: In your last three fights, you have beaten Shane Mosley by unanimous decision, and won two others by knockout. How do you plan to fight Peterson? DA: Well, as they say: “the fight will show everything.” Everything will become clear over the course of the fight. RT: The winner of this fight will challenge for the WBA ‘super’ world title, which Thurman and Garcia will contest on March 4. Who do you think will win that fight? DA: Both boxers are real professionals, very strong fighters, but I would have to give a slight advantage to Thurman in that fight. RT: It’s already a year and a half since you moved to England and teamed up with Neil Marsh and Carl Greaves’ stable of fighters. Tell us a little about your achievements in that time. DA: My second fight with the team was already for a title of interim champion, then after a defense against one of the legends of boxing [Shane Mosley] in an American ring, now I own the regular title of champion of the world. My team are real professionals in the course of their work and I want to express my greatest thanks to them. RT: You recently said that English boxing fans are the most passionate fans in the world. Why do you think that? DA: I’ve been to various boxing shows in different countries and have never known such a huge love for boxing and for the boxers like in England. Children and adults give huge respect towards athletes and value their hard work. RT: Do you have a fight that you remember especially in your career? DA: Every fight is memorable, every fight sticks in the memory. I especially remember the fight with Mosley, because it was my first fight in an American ring. RT: How does boxing in England differ from boxing in Russia? DA: Boxing in England is more developed, here there is a different attitude to it, a different approach to training. RT: Do you have a message to you fans who have supported you? DA: To my fans, who wish me success, who genuinely support and care for me, I want to say thank you, I wish them health, and peaceful skies above them. I get a lot of messages of support, I see them, I value them a lot.